We decided about a week before Spring Break to visit Philadelphia. At that point, we were scrambling to find a hotel room for our trip. The last time either my husband or I visited Philly was in our childhood, so we were unfamiliar with the size of the city or the locations of the various points of interest. 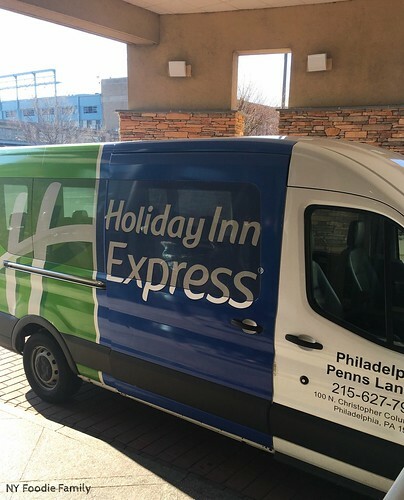 When perusing expedia.com and tripadvisor, the Holiday Inn Express (HIE) Penn’s Landing popped up with some of the most reasonable rates. 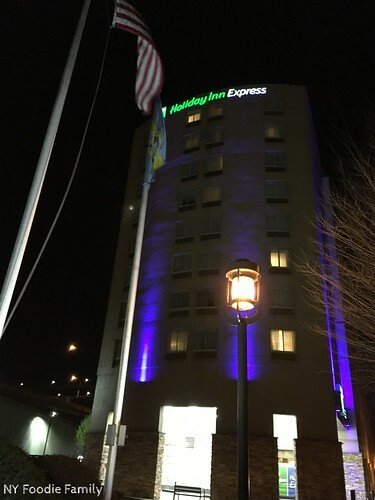 The hotel is conveniently located in the historic Old City on Christopher Columbus Boulevard, right off the highway. 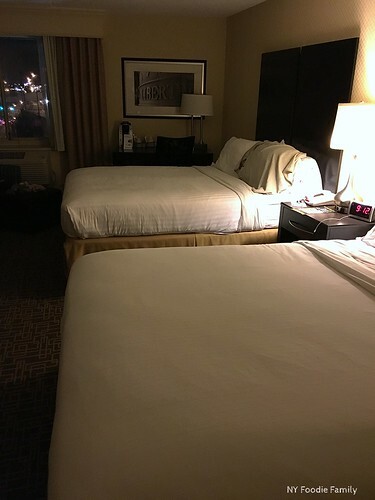 We booked our room a week in advance directly via the hotel website and took advantage of their “Book Early and Save Price.” This price was even cheaper than the AAA rate. However, this rate is available only for those stays booked at least 7 days in advance and is non-refundable. We were going to make it there no matter what! After researching hotels we realized that almost all hotels charge for parking. At the HIE Penn’s Landing, it costs $30 per night to park your car or $20 per day. What ultimately sold us on this hotel was the free Express Start Breakfast and the free shuttle. We left our house in Northern Westchester County, New York around 6:30 AM and with a couple of rest stops make it to Philadelphia around 9:30 AM. We drove directly to the hotel and parked the car, but check-in was not available until 3 PM. We walked from the hotel to the historic district and started our day. We didn’t return to the hotel until close to 5 PM, when we checked in and relaxed in our room for a bit. When you enter the hotel there is a fireplace and seating area, with the check-in desk to your left. There is a decent size dining room with tables and chairs, as well as a separate Express Start Breakfast room with taller tables and stools. (On a side note: Sunday night it ended up raining and then snowing. When we got back from dinner, a family was sitting in the dining area with some takeout Chinese food that they had ordered. I thought this was a great idea and great use of the dining room, instead of trying to eat in a hotel room!) The hotel also has a fitness room, which we didn’t visit. The kids were disappointed that the hotel had no pool, but we were so busy, that they wouldn’t have had time to swim. Plus, they were unaware that we were visiting Sahara Sam’s Oasis on the way home. We reserved a two queen bed room, which we found to be spacious enough. We were only staying for two nights, and in general we don’t need a lot of room (just more space for the kids to leave/lose their things!) I especially enjoyed sitting in the corner arm chair and ottoman to read and the kids liked laying on the bed to watch television. While I normally bring my own shampoo and conditioner, since this trip was so short I didn’t bother. My daughter was super excited that the hotel had Bath & Body Works toiletries, since she’s a big fan of the store. The Express Start Breakfast is served daily from 6 -10 AM. 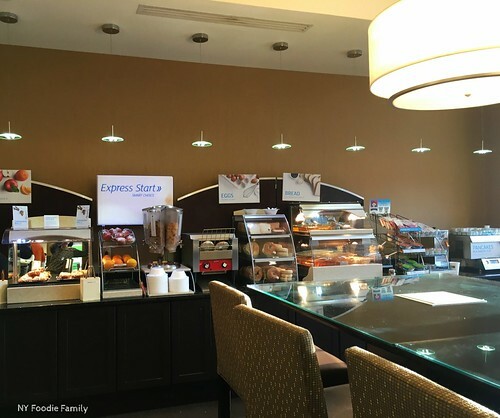 This was one of the best staffed hotel breakfast bars that we have experienced. The breakfast selection included hot items like sausage, bacon, eggs, western omelets, biscuits and gravy, and a pancake machine, cereal, bagels, toast, muffins, fresh fruit, yogurt, hard-boiled eggs and the kids’ favorite, cinnamon rolls. There was also a juice machine and a coffee, tea and hot chocolate bar. While eating, we saw a mix of people staying at the hotel including families, older couples and several school groups. We used the free shuttle only once when headed to the Philadelphia Museum of Art. Our driver was super friendly and took us all the way out to the museum, even though they normally don’t drive out that far during morning and evening rush hour. The driver was a great resource on food recommendations – ordering your cheese steak with cheez whiz is a tourist thing to do and a must-try at Reading Terminal Market is the pork sandwich with broccoli rabe and provolone (we had already eaten this before his recommendation!). and the location of points of interest – where we could find the famous “Love” sign, though we didn’t get a chance to see it. 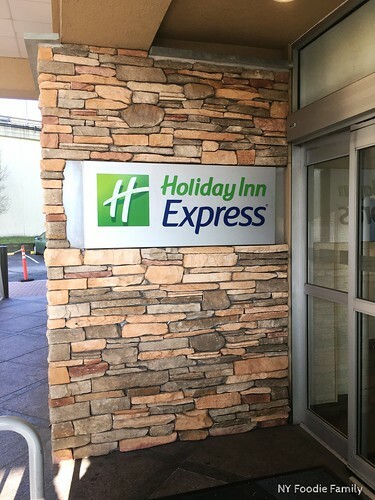 Overall, we were very happy with our stay at the Holiday Inn Express Penn’s Landing. 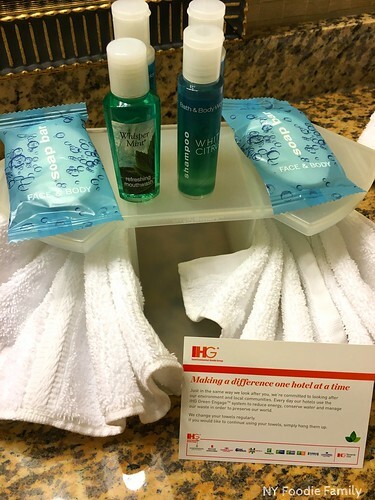 *This post was not sponsored by Holiday Inn Express. We just had a great experience and wanted to share it!